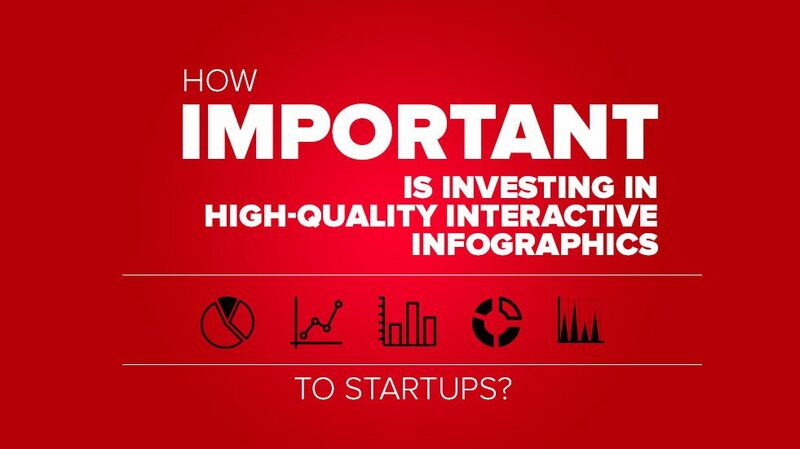 How Important Is Investing In High-Quality Interactive Infographics? Graphic design has always been an important part of product distribution but never more so than current day products that are relying more and more heavily on the design of their brand to help create an experience for customers that’s both engaging and valuable. How a company chooses to design their brand affects how consumers view and understand what they are purchasing. Graphic design is important for the hierarchy of information that appears on product packaging, in brochures and through infographics to communicate not only effectively, but also aesthetically. So when your business is first getting off the ground, how important is it to invest in high-quality infographic design? What things matter and what things can be put off for another time to help stretch the budget farther? Let’s take a look at how important investing in professional infographic designs can help shape the face of your business for the future. But we proceed any further, it’s important to remind you that static content is dead and it’s important that you invest only in high-quality, interactive infographics. Remember, 70% marketers believe interactive content increases visitor engagement. Interactive infographics add value to many situations that marketers and businesses find themselves in every day, but they don’t apply to every situation or customer base and the first step in investing in something as specific as an interactive infographic is knowing when they should be used in the first place. Think about your target audience and what service you are providing to them. Do you work in a field where interactive infographics are prevalent, used infrequently, or maybe not ever used at all? The answer to that one question should tell you whether investing in an infographic to convey your message is standard practice, a unique approach, or even inappropriate altogether. Some business niches just don’t have a place for an infographic on a regular basis and that’s not a problem, but knowing when to use them or not can be tricky. Interactive infographics add value and can catch consumer’s interest, but they have to make sense in order to direct consumers appropriately to your products. Interactive infographics have a special place in business communication with its customers. Not all information is easy to convey without it becoming confusing or seeming disorganized. Charts, graphics and tables can sometimes overwhelm a customer visually and part of the job of marketing is to clearly, concisely communicate your goals and stance to a customer. Using interactive infographics to do this makes the job easier for you and easier for the customer to effectively interact with the data and the entire process. Focusing on how and when to communicate information to consumers helps to cut down on the frustration both from you and from them. Complex information can be daunting to share and consumers will avoid publications that seem extremely complex or difficult to understand in many different genres of business. Don’t lose your consumers in a landslide of information so they can’t grasp the importance of your facts. Once you’ve decided that your interactive infographic should be a foundation of your marketing strategy, it’s time to think about what content you will include in them when you push them out to your customers. What information do you have a need to convey? Is an interactive infographic the best way or most engaging way to present it? Is the content comprehensive and accurate? The importance of having content that is not only well organized but accurate should not be overlooked. Not every customer will spot mistakes in facts and figures but given the state of the world wide web and social media sharing, you can be guaranteed that those who do spot the inaccuracies will share them with the rest of the public. It can make for an embarrassing situation, so avoid it by fact-checking and citing your work carefully. It’s not just a good idea, but almost imperative to hire a graphic designer that is familiar with the purpose and practice of using interactive infographics to communicate effectively. Designhill offers you the ability to work with a veritable community of graphic artists that are waiting to structure your interactive infographic design to be bold, eye-catching and informative. Using a service designed to put you in contact with many different artists helps you see a range of design options and work with the designers that most emulate the vision you have for your work. Don’t be afraid to talk about what you need and what you feel works for your customers and the more information you give them, the better they can capture what you’re looking for. If you work with digital marketing and print publications, chances are you’ve seen interactive infographics used many times to give otherwise mundane information a pop of creativity to keep the engagement with consumers high. This method of structuring information to communicate with customers is not only appealing to the eye, but makes absorbing the information you’re trying to get across easier and can make or break the relationship between you and your customers. People looking for information, products or services are more likely to buy when they understand exactly what you’re offering, so put interactive infographics to use for your next marketing campaign and see the positive impact they can have.